The best cancer prevention foods? 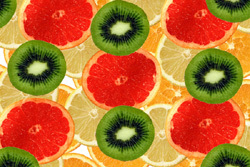 I've always believed that the best ways to prevent cancer and any illness is a healthy diet and lifestyle. Although the incidence of cancer is presently on the rise, hopefully, as more people become informed and continue to make positive changes in their diet, that trend will change. The best cancer prevention foods according to the World Cancer Research Fund and the American Institute for Cancer Research are the same suggestions that I put together in my healthy eating guidelines. Their suggestions: (Where they say limit, eat sparingly, or avoid, I would suggest reduce and eliminate). Eat whole grains and or legumes (beans) with every meal. Limit refined starchy foods (white bread, white pasta, white rice, processed cereals). Eat very little, if any processed meats. Eat less than 500 grams of cooked red meat a week. Limit table salt and salty foods. Eat fast foods sparingly, if at all. Avoid sugary drinks. Instead try freshly brewed green or black tea. I suggest, instead, drink pure water, and organic naturally decaffeinated green tea. Eat sparingly, foods that are high in calories and low in nutrients (chips, candy, chocolate, cakes, cookies, ice cream, sour cream, fried foods). Now let's take your cancer prevention food list one step further. Dr. Béliveau is a leading authority and is known throughout the world for his work in the field of cancer research. In the book "Cooking with Foods that Fight Cancer," the authors, Dr. Béliveau and Dr. Gingras suggest these foods as the best cancer prevention foods. I encourage you to always choose organic produce whenever possible to avoid cancer-causing pesticides and chemicals. Rich in essential minerals, especially iodine, potassium, iron and calcium. It is also rich in proteins, vitamins and fiber. Recent research indicates that algae contain significant quantities of anti-cancer compounds. This could explain the low incidence of breast and prostrate cancer in Japan compared to that of Western societies. Use dried sea weed that you rehydrate for 5 to 10 minutes and add to soups and other dishes. According to Dr. Béliveau "Certain mushrooms, such as those of Asian origin, (shitake, enokitake and maitake) as well as boletes (oyster mushrooms), are especially rich in anti-cancer molecules that slow tumor growth and the progress of cancer." Dried mushrooms may be substituted for fresh. You simply allow the mushrooms to soak for about 1/2 hour in boiling water. A freshly squeezed glass of orange juice will provide more than your vitamin C. Numerous studies show that consuming citrus fruit reduces the risk of developing digestive cancers by half (esophagus, stomach, colon). They also reduce inflammation. High in Omega 3 fatty acids, flaxseeds lower the risk of breast, colon and prostrate cancer, and the metastatic potential of cancer cells. They also contain phytoestrogens. This high lignan content is valuable in preventing breast cancer. It is important to note, flax seeds must be ground or they will go in one end and out the other. You can grind them as needed in a coffee grinder. Do not keep ground seeds more than a few days in the fridge as they go rancid quickly. Do not buy pre-ground flax seeds and be careful with flaxseed oil as it also turns rancid very fast. 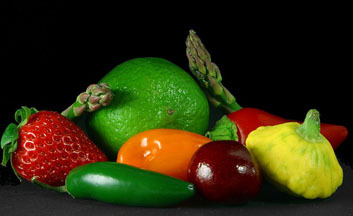 anti-inflammatory foods we eat, the less chance many illnesses, including cancer, can develop, as disease thrives in an acidic terrain, not an alkaline terrain. Tumeric needs to be stabilized in oil before it can be absorbed by the body. If making a salad dressing, add it to the oil first, before adding the other ingredients. 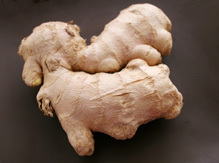 Fresh ginger can be sliced for a healthy herbal tea or it adds a lovely zest of flavor to all kinds of dishes. Our intestinal flora must contain enough beneficial or good bacteria in order to disallow bad bacteria to take over. Not only do probiotic bacteria prevent cancer they also reinforce the immune system, help decrease constipation, cholesterol, osteoporosis, and more. Choose plain, organic yogurt (add berries) as most of the fruit flavored yogurts are extremely high in sugar. Contain glucosinolates, powerful anti-cancer molecules. Enjoy cabbage, broccoli, cauliflower, kale and brussel sprouts. The garlic family are powerful natural antibiotics that fight against the growth of cancer cells. People who regularly consume garlic and onions have less incidence of esophagus, stomach and colon cancers, (cancers of the digestive system). 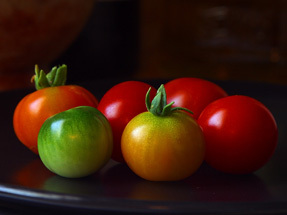 Cooking tomatoes with oil increases lycopene content which might reduce the possibility of developing prostrate cancer. Are high in anti-cancer molecules and antioxidants, especially blueberries. Of all the foods, green tea contains the highest proportion of anti-cancer molecules. It contains catechins that block the development of cancer cells. It may block mechanisms used by cancer cells to reproduce and invade surrounding tissue. Choose Japanese green tea (naturally decaffeinated) over Chinese tea, steep for 8 to 10 minutes, and try loose tea leaves brewed in a teapot. By adding these cancer prevention foods to your diet, you are multiplying your ways to prevent cancer, highly increasing your chances to keep cancer away.